Welcome to part two of my post on finding an apartment in Jerusalem! As I mentioned earlier, I finally found a place to live, on my own, in the center of town in Jerusalem. It was at the upper end of my budget, but I was determined to make it work. The only issue that had me concerned was the fact that it was a loft space, with only a rickety ladder connecting the main area to the loft/sleeping area. My Persian landlords (pertinent information for the story) assured me they would build me a small staircase to connect the two. They even put "new staircase" in our contract along with "small fridge" (aka mini fridge, as it turned out) and some other goodies to sweeten the deal. As I had never signed my own lease contract (in a foreign language) before, I gave the lease to some very well-meaning, very non- lawyer Israelis I knew. They seemed super concerned about the contents of the contract but I soon found out it was all standard. As in, "I signed my life away" standard. No matter! I had an apartment to move into and my stairs were going to be built and life was sababa! The first snag came whenever I would ask the landlords when the stairs were being built. The answer was always either "next week" or "tomorrow" when in actuality they were not being built next week or tomorrow! A month before I had to move out, I was chilled about the situation, but as my eviction- from- ulpan date neared, I started to get a little panicked. The stairs were taking too long, the landlords said they were getting too pricey, there wasn't enough room for them, and on and on the complaints mounted. All I wanted was to head up to bed at night without taking my life in my hands- was that too much to ask?! Add to this my whole "furnishing an empty box" situation- I had my closet and bed being delivered to a loft with only a rickety ladder! Finally one day, I came into the landlords' store, two doors away from my apartment building and Mr. H had a big smile on his face. He told me to "go check upstairs" and I was absolutely gobsmacked! 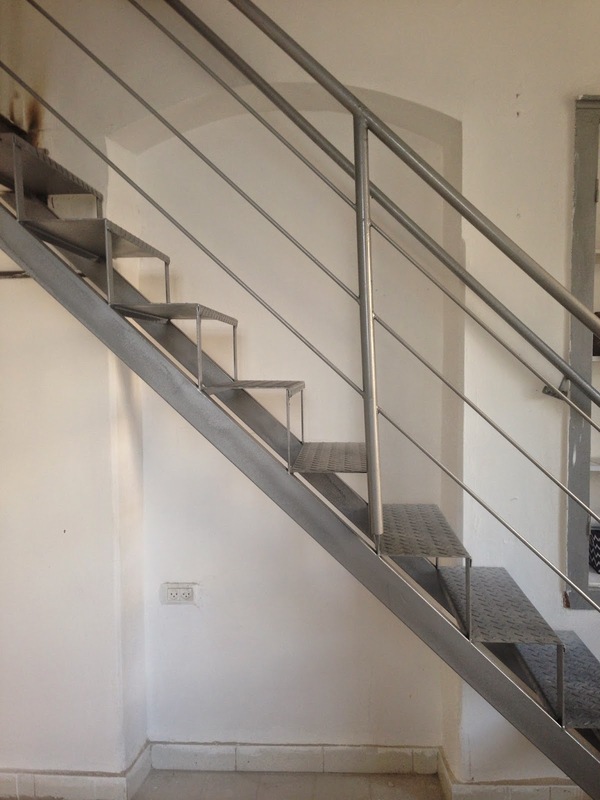 After weeks of waiting, my stairs were built with no fanfare and not even a word to me- a special surprise! I ran up the stairs and peered at the area where they should be but saw no stairs. Weird. Then I noticed something on the exact opposite side of the apartment. My stairs had been built, big and strong, on the wrong side! I was a ball of emotions; confused, excited and ultimately horrified. Because, you see, the stairs had been built completely blocking the indentation in the wall meant to house my closet! Which would be delivered in 30 minutes! Um, are these stairs blocking anything important? I ran back down to the landlords and in a rush of Hebrew, English and tears, demanded to know how and why this happened. After no less than ten conversations dedicated to "the stairs situation", why was the concept of putting the stairs on the other side of the room never mentioned? Why were they put up with no consultation with the person who would be using them? The landlords were shocked. They thought I would be happy! In a mixture of Hebrew, Farsi and tongue clicks, they assured me this was the best option. 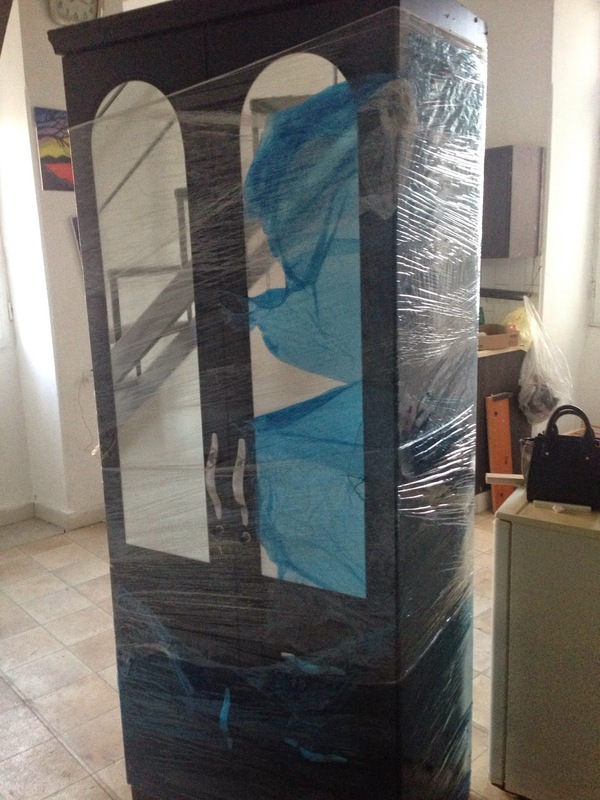 And in the midst of this chaos, my closet arrived! Except now it had no home, so it sat in the center of the apartment, one gigantic testament to the silliness of the stairs current location. The landlords tried valiantly to show me where my closet should now sit, but in such a small space, there is a place for everything and everything had it's place. And the stairs had to be moved. My landlords, being the very sweet and well-meaning people they are, agreed to have the stairs moved, while still warning the construction crew to "never marry an American girl." Touche. As you can imagine, the stairs were not changed the next day. Nor the next. And then it was shabbat so not then either. 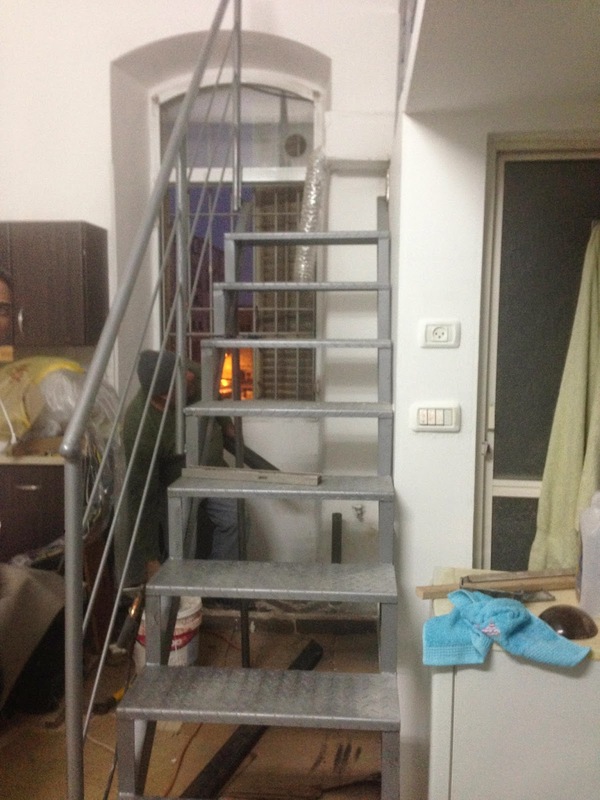 On Sunday, a regular working day here, I raced from my end- of- ulpan test to supervise the construction of these infernal stairs. I got to the place and the landlords informed me that the builders weren't coming, as one was sick. I inquired "hospital sick?" and he wasn't. I told the landlords "These builders are making a fool of us. I need to move in and they are completely unprofessional. I'm not telling you to fire them, but I would call them and say I'll never use their services again. You guys are way too nice." Now, reader, you may think I'm being too tough in this situation, but I have the dual honor of being a New Yorker and now an Israeli. And my New York-Israeli mentality does not allow for such shenanigans. And you know what? It really lit a fire under my landlord. An hour later he called me and said he convinced the builder to come at 3 that afternoon! And by 3, obviously the builder came at 4. But he came! And built me stairs! In the exact location we discussed! And they are beautiful! And so, dear reader, I now live in the loft of my dreams, with sturdy stairs and a closet in a closet-sized hole in the wall. All is right in the world and I invite any and all of you to come see the stairs for yourselves, should you ever find yourself in downtown Jerusalem!